Third day skiing on Wednesday but this time at a different resort, Lake Louise rather than Sunshine Village where we skied the first two days. It was also the third night of very disturbed sleep. I go to bed and drop off straight away, very tired after the day’s exertions but then wake up after about two hours and doze fitfully for the rest of the night. It’s beginning to take its toll. Normally I sleep very soundly all night, undisturbed by even the most violent of thunderstorms or minor earth tremors. Ruth reckons that it is jet-lag and that it affected her for 4 or 5 nights when they got here. Whatever, I knew I needed a good night’s sleep when I got out of bed this morning. Which was not a good preparation for skiing at Lake Louise. I had been told that the runs were both longer and more difficult than at Sunshine Village, and that the snow was different. All of which proved to be true.. I had not had any falls on the first two days. Wednesday morning and I crashed out big time within the first 10 minutes on one of the easier runs. Fortunately I only suffered a bruised ego. But because of the icy cold weather the snow in which I was coated lasted all day as a mark of failure. Not so with Snowboarders. They seem to spend half the time sitting in the snow in the middle of the piste, chilling. They even wear shirts with long tails to sit on and to collect the snow as a mark of respect. But on skis its different: “Look at him, he fell over on a green run”. Humiliating. The runs at Lake Louise are certainly longer and in places steeper and I felt that any progress I had made in the last two days was negated. I did two runs on one piste, the second time in a determined effort not to fall over again. I didn’t fall over but it was not very stylish and in places I resorted to beginners’ ‘snow ploughing’ in order to try to stay in control. It was hard work. The snow is certainly very different. One thing which strikes you arriving in the ski lodge and looking out to the runs is the snow blowing equipment constantly showering the slopes with artificial snow. Essentially they are like firemen’s hoses shooting water spray into the air which then freezes and falls onto the pistes. In reality it is ice not snow and mixes with the natural snow to give a firmer base to make the runs last into early Spring. But it changes the soft consistency of the natural snow and makes the surface of the runs harder and more inclined to become icy. I found it a lot more difficult going but a good player doesn’t blame the pitch. The deficiency is in my skill level..
After the first two runs we did a run from the top of the same lift to get back to the Ski Lodge for dinner. That was quite a different kettle of fish because it was considerably longer with a number of sustained steep sections. Altogether it dropped 2,400 feet. My legs had stopped screaming by the bottom and just felt numb, jelly-like. But I made it down in one piece with no more humiliating falls. Ruth and Tim’s normal pattern is to ski three days then have a rest day, then ski two days and have arrest day. So Thursday (07.00 to 07.00 GMT) will be a day to recover. Hopefully. 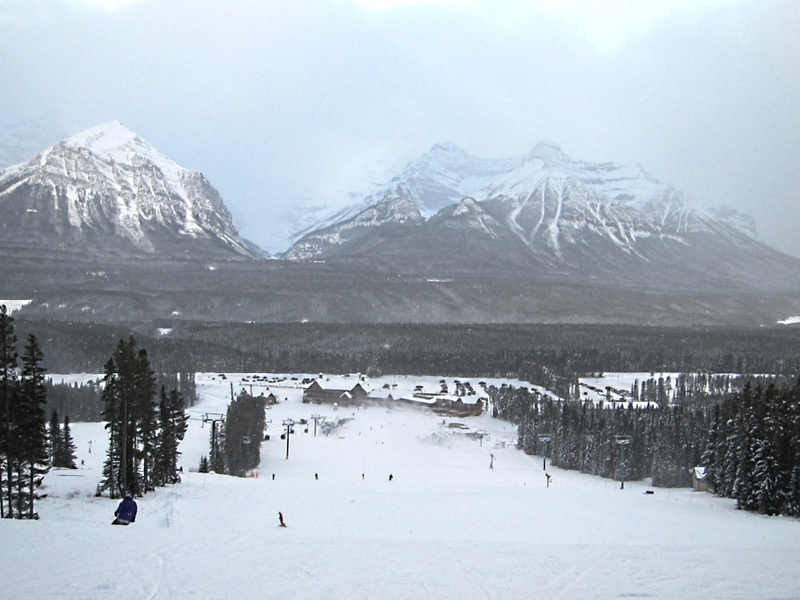 We’ll be doing more skiing at Lake Louise than at Sunshine Village because that is where my ski pass is for. My hope is that a combination of a day off from skiing and a return to normal sleep pattern will better equip me for the challenge. Never mind the skiing, how on earth are you managing the unfeasibly low temperatures?